What is Footy Funatics ? 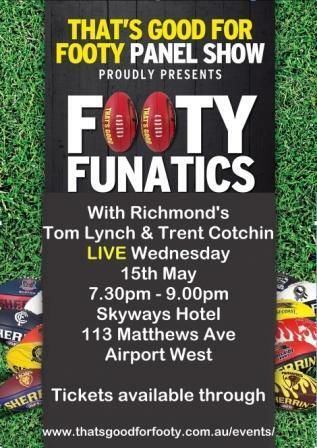 “Footy Funatics” is a LIVE AFL based Footy panel show, which is recorded in front of a LIVE audience, every Wednesday evening from venues all across Melbourne. 2 current day players are present at every show from the respective club appearing on the night, It is a Club themed night. We discuss a little bit of Footy & a little bit of general trivia and we get to go behind the scenes with the players, We ask them about themselves and how they see footy & life in general, and then we ask them what they know about Footy & life in general and at the same time we get YOU involved, this way we get to see how much you know about Footy as well. It is a totally LIVE, RAW & INTERACTIVE experience, The shows were developed to give the fans & supporters of this great game the opportunity to have a bit of fun. We also give the fans & supporters the opportunity to get a photo and autograph with the players on the red carpet. The shows are hosted by Damian Rocher, Producer/ Director /Presenter & founder of the shows. The venues whom host these shows provide meals, drinks & seating, so it really is LIVE entertainment in a socially interactive atmosphere. Purchase your tickets to any one of the “Footy Funatics” nights and be entertained by the panel, whilst you enjoy a meal from the venues kitchen, or grab a drink from their bar. Tickets can be purchased by simply going to www.thatsgoodforfooty.com.au/events/ and follow the instructions, bring your confirmation with you on the night and present it at the door upon your arrival. Admission : There is a administration & door entry fee of $20 +gst for Adults & $10 + gst for Children under 15 applicable for this show, ALL tickets are sold through the TGFF website, there is NO FREE entry. This show will run for approx 1 & 1/2 hours. We have Memorabilia for sale on the night and we run a raffle with 1st, 2nd & 3rd prizes up for grabs, 1st Prize is a Player Signed & Framed Photo, 2nd Prize is a Team Themed Footy Hamper, 3rd Prize is a signed game size TGFF Football. 4th Prize is a Player Figurine & 5th & 6th prizes are signed mini size TGFF Footballs. There is a trivia segment, Club theme song singalongs, merchandise packs to be given away and plenty more entertainment, And this is why it is called “Footy FUNatics”. NB: These shows are neither endorsed or affiliated with the AFL or any of the AFL clubs appearing on the night in anyway shape or form. The players appearing on the show do so of their own volition, Neither the club or the AFL play a role in promoting or endorsing the shows. TGFF do not receive any funding from either the AFL or the Clubs represented on the night. No monies raised from the night go to either the AFL or the clubs represented on the night. TGFF panel shows are run as a business solely owned operated & registered as BrokerrocheR. 253 available	 Richmond Cotchin & Lynch Adults SH $20.00 All tickets are general admission, all ticket holders are guaranteed entry and seating, but seating allocation is on a first in best dressed basis. 90 available	 Richmond Cotchin & Lynch Kids SH $10.00 All tickets are general admission, all ticket holders are guaranteed entry and seating, but seating allocation is on a first in best dressed basis. up close and personal with the players. insights you wouldn't otherwise know. a great show. highly recommend. you can't go only once. Loved the St. Kilda 🔴 ⚪ ⚫ Show at Village Green it was a great night full of fun. Loved to see Tim Membrey & Jade Gresham. I was lucky and Won 2nd Prize in the Raffle the Hamperworld Prize. Looking forward to the next St. Kilda 🔴 ⚪ ⚫ That's Good for Footy Show. Very entertaining in a relaxed environment. Dammo, Sandy and the rest of the crew do a great job. Lots of fun, lots of prizes. Super to see a couple of the boys each time relaxed and social. Fun laid back back night getting to know the players more and having a few laughs. Very well presented. Once you go you will be a regular. Keep up the great work guys. Awesome family night out. Damo and Sandy do a wonderful job and last night at the Collingwood show they made it extra special for my son as it was his birthday. Thankyou. Great night out! Kid friendly and a lot of fun for everyone! Awesome show, lots of fun and laughs. Great show, love the interactive games with the audience. they are fun nights..will attend more of these. Great fun and extremely entertaining. A chance to get up close and personal with the players which is not very common these days. Great interactive show giving the fans insight to the players lives and love of the game. Highly recommend attending with all the family. Great to see the players relax and have some fun! The events are priced so anyone can attend, extremely well run, informative and importantly entertaining. Very entertaining evening I will go to more of them . gr8 night of Entertainment, Damo involves everyone, gr8 set, well put together, highly recommend this show, keep up the gr8 work Damo and hang, very much looking forward to seeing you next year..
Great show. Recommend to all. It’s a nice relief to find a footy show that doesn’t cost a fortune. It was very well done and the players were relaxed and natural. So much fun. Will definitely attend more shows in the future. A fantastic event run by a trio of beautiful people. I haven't enjoyed myself with a bunch of strangers so much since the prelim last week. I will be a regular next season and will recommend it to everyone! Well done guys. Great interaction with the show and access to the players who give up their time to give back to the fans!! Awesome show!! Had a blast coming from WA and definitely the highlight of my trip!! Cancelled a MFC show for a pies one! What a joke! TGFF always puts on a great entertaining show with great player appearances. Do yourself a favour and get to a show!!! Great experience, loved the Cats show. $10 well spent for a great night out! It’s a show that is all about the money, not the fans. Thanks for a great night..another tigers night in the west and ill definitely go again..Highly Recommend! Good fun show! Players much more authentic than you see in their other media appearances. The events are great. Funny segments, excellent player access and usually candid responses due to the relaxed environment created by the host. Most venues are good too. I've been to a few of these in the eastern suburbs over the past 12 months. My only complaint is how the booking and entry to the venues are handled. I've mentioned this many times but nothing has changed. We all arrive with a ticket/booking confirmation. They have barcode on them could be quickly scanned if you invested in a barcode scanner. If they cost too much, and the tick-off at the door has to be handled manually, WHY ON EARTH is the list of attendees not sorted alphabetically?? In LAST NAME ORDER preferably! Instead, every single time, we've had to stand in a long queue outside the venue (twice in the pouring rain!) while EVERY NAME on the list is read over looking for each person as they arrive! This is such a simple solution that would be easy to implement - it would take two mins to sort the list alphabetically and print out before the event. Looking unprofessional sets a bad tone for people as they arrive. And standing unnecessarily in the rain for well over half an hour doesn't lift one's spirits either. I've often stood outside wondering why the queue was moving so slow. It wasn't just because there was no barcode scanner or a sorted list, but tickets to the raffle were being sold at the same time! I think this should be done once people are IN the venue, maybe a quick walk around to people at their seats or standing at the bar when they have their money out. It's not a personal attack on Sandy who is always friendly and welcoming, it's just a suggestion that I think would make her job easier too. Such a affordable terrific family night for school holidays! My children were so happy to see Charlie and Crippa up close. They were so down to earth and friendly, giving up their time for their fans. Top effort to everyone involved. Always a fun night. More St Kilda shows please! Thank you for the great show tonight at the Village Green with Geelong greats Gary Ablett and Mitch Duncan. Was awesome to get my photo taken with the two greats!!! And then to top it off got Gazza's signature on my footy coat!!! Enjoyed last night at the Bayswater, Trent & Shaun were excellent panellists. Might have got an excellent if the photo I had taken hadn't been double exposed and unusable. It also seems to be a theme that you don't get to get anything autographed. I see lots of other people have the same comments. You always seen to run out of time. Thanks for an awesome night at the Manhattan Hotel with Adam Treloar and Brodie Grundy. What absolute legends those young men are. Such a fun relaxed night everytime. So good to see the players personalities come through. Highly recommend getting along to your teams next night! Absolutely amazing night thoroughly enjoyed the show thank you! Will definitely be going again! A night of laughs & entertainment. Last night was our second show we’ve attended and won’t be the last! Thank you for bring Trent & Dusty to Morwell last night. It was just fantastic. It put a smile on my face all night. Well done. Better than the footy show. Thanks so much That's Good for Footy. We had an awesome time with the Geelong boys. Thanks to Damien and the team for a very well run and fun night!!! Had a really good time and really enjoyed the show however we were a little disappointed being told we couldn’t get an autograph from Dusty only photos as we were short on time, to later find out autographed posters (normally $5 without autograph) were $15. When as a family you pay out $100 a head, I feel the autographed posters should have been included. Woohoo Dusty. What a night in the RAT!!! So much fun. Rippa show, rippa guests. Loved the variety and honesty of the guys. Fantastic night! Great to see the players relaxed and having fun too. Way better than The Footy Show! Will definitely go again. Absolutely incredible! In what other sport can you interact with the stars like this? Unbelievable. Incredible. Amazing. Could not fault one thing. Thank you so much, I will most certainly be back! This is by far the best footy show around. Had so much funny the Saints night tonight. Rooey & Joey are the most down to earth, genuine and funny guys. I can't wait to go to more shows next year. Tremendous shows. Lots of light hearted entertainment with the players characters coming out. Very well hosted as well. Bloody love my footy and love this show. Sandy was so accommodating! Will be attending weekly! Great night out and so affordable. Get to see the players in a relaxed atmosphere and then get a photo. Fun for all ages. Had such a great night with the Essendon boys, so much fun and interaction, a very professional setup, can't wait for the next bomber night, keep up the great work. Great show for the fans. Get along, have fun and meet real life AFL footballers. Go you mighty bombers! Fantastic relaxed night with great atmosphere, lots of laughs and big thank you to Adam and Brodie for their time along with the TGFF team! we had a ball, so many laughs and so many prizes to win, a chance to get up close with the players and get a pic, autograph or just a chat. so much fun in a more intimate environment than other bigger shows. can't wait to go again ... GO BOMBERS!!!! Great shows, I love them and go to as many as possible. A great fun night out with supporters of your Club. Very well run, do yourself a favour! Great atmosphere with plenty of laughs and candid answers! This is the third one of these I have been to. It is always a great night- lots of fun, and so enjoyable to be there with many other fellow Dees supporters. Looking forward to the next one. What a great night that's organised for locals to be apart of their favourite footy team & players! Great idea guys & the best thing is it's cheap & children are welcomed. Great night, 3rd one I've been to & will definitely go again! Always amazing and entertaining! �� so personal with the players and all round great night! Excellent grass roots footy show! Keep up the great work to the crew, and thank you to the players for giving up their time to allow the supporters to get up and personal. Go Pies!!!!! Fantastic show. Great opportunity to get up close and personal with your favourite players! Great show cant wait too go to see more shows . Would love to go to may 17 th . Great night, lots of laughs and fun. Was awesome having our photos with Dyson and Jamie. Very friendly atmosphere and awesomeness interaction with current afl players. Love the show it's awesome! It's a fantastic opportunity to interact with the players in a different way! Really honest grass roots footy show for the fans. Carn the demons!! Copyright © 2019 That's Good For Footy Panel Show. Powered by WordPress. Theme: Accelerate by ThemeGrill.